RCP was proud to be one of the sponsors of the 2018 NZ Green Building Council Housing Summit held on Wednesday this week. Members of the RCP team attended alongside leaders from the residential housing sector, to focus on tangible ways to improve housing for today and future generations. “RCP has many clients who are committed to using more sustainable and environmentally-friendly construction techniques to create warm, dry, healthy homes,” says RCP Senior Associate Matt Murphy, “however it was disappointing to hear that NZ lags well behind countries like Australia, the UK and parts of the US, particularly in the area of thermal compliance. 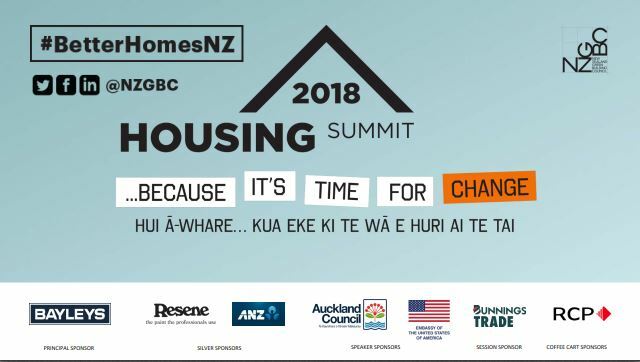 The KiwiBuild programme’s integration with the Homestar rating system was also a major focus of the Summit. “This project is the biggest government-led housing programme since the 30s & 40s, so it’s got to be done right. It was heartening to hear the government is aiming to deliver a Homestar rating of 8 as standard in all KiwiBuild homes by 2024, as they head towards a Zero Carbon goal by 2027,” says Murphy.